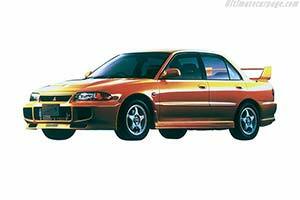 February 1995 saw the introduction of the third Lancer EVO. Compared to its predecessors the EVO III was fitted with a higher compression engine, adding another 10 bhp to the output. Aerodynamics were again revised with a more aggressive front bumper and a new rear wing. In rallying the EVO III was used throughout the 1995 and 1996 seasons, with a lot of success. With 6 victories Mitsubishi finished second in the constructor's championship in both season. More importantly, Tommi Makinen scored his first of four driver's titles for Mitsubishi. In 1997 the first series of EVOs was replaced by the EVO IV, which featured a completely different body.